China is by far the largest job market for ESL teachers, but the vast number of opportunities makes it hard to decide on a job. 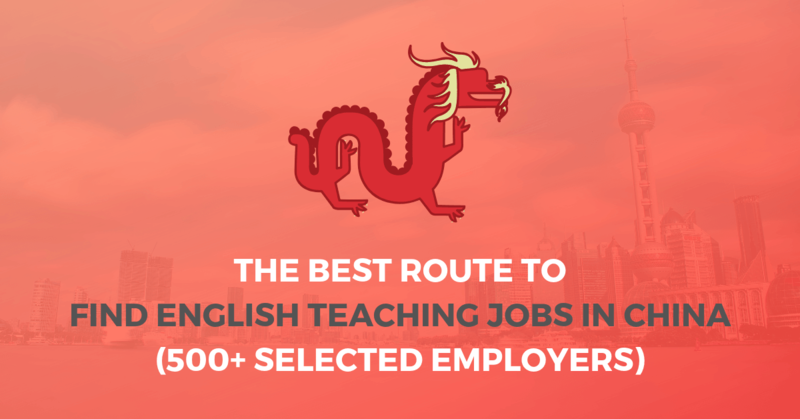 In this post, we’ll introduce you to the most convenient route to find English teaching jobs in China which REALLY suit your preferences, without all the hassle. You’ll learn about the available opportunities, the benefits for you, the requirements and the application process. Ready for your China teaching adventure? We promise you will end up with an ESL teaching job in China you will love! JIMMYESL and Gold Star TEFL Recruitment have hundreds of jobs to teach English in China for you, regardless of whether you are an experienced or aspiring teacher, from Kindergarten to University teacher, in over 60 cities. Submit your application and get hired by reputable schools in China in no time – all absolutely free of charge for you. You are a native English-speaker with any degree (and ideally a TEFL certification). You apply to us and tell us your job preferences. We shortlist suitable jobs for you, connect you with the schools and guide you until you start working at the employer of your choice. Send us your application today and we’ll send you suggested job opportunities within a few days! Why should you send your application to us instead of searching for jobs in China on your own? Job placement all over China: Find a job in one of your preferred cities and language schools. Over 500 selected employers: No scammers or shady schools – we work with trusted partners. Shortlist service: No need to browse dozens of job listings on various job boards. We preselect jobs according to your preferences. Completely free of charge: We do not charge any money nor do we deduct a cut from your salary. Z work visa provided: Teach in China 100% legally and get help with the paperwork. Experienced consultants: We are former ESL teachers and know what is important for you. Guidance for candidates: Ask us any question that pops up during the recruiting process. We have hundreds of ESL teaching job openings in China, from over 500 trusted schools in over 60 cities, which are updated frequently. You do not have to browse listings and decide on a particular one. With your application, you tell us your preferences and we will send you a shortlist with offers that suit you best. Send us your job preferences and let us do the work for you. Undoubtedly, China is the largest TEFL job market, there are ten thousands of ESL teaching jobs in China and there aren’t enough teachers to meet the growing demand. From kindergarten kids to business people, the Chinese are eager to learn English from native speakers to raise their chances on the global stage. As an ESL teacher, you will make a salary from $1,000 to $3,500, dependent on the city and the type of school you teach at. This will enable you to live a comfortable life and save money nevertheless. The majority of ESL teaching jobs in China are teaching kids in private or public schools – so if you love kids and are an energetic, fun teacher, finding a job for you will be a breeze. However, there are enough teaching positions where you can work with teenagers or grown-ups. At Kindergarten or preschool ESL teaching jobs in China, learners are from 3 to 6 years old and class sizes usually range from 12 to 25 students. Young learners have short attention spans, so you will conduct short lessons made up of a variety of activities, like games, singing, dancing, drawing or playing with puppets or other props. Provided that you love kids, kindergarten jobs are a lot of fun and meaningful at the same time, as you play an important role in the children’s early development. As an English language teacher in a public school, your job is to develop the students’ speaking, listening, reading and writing skills and to help them to hone their communicative and fluency skills. You will have to follow a set curriculum by the school and work together with a local Chinese teacher. Class sizes can be large with 25 to 45 students per class, which can be a challenge when it comes to engaging students. In a private language center, you most likely will have to teach learners of all ages, kids and teenagers are the majority, of course. Each language school has its own teaching approach, but normally, lessons are focused on English communication training, so you will have to encourage your students to speak and use the language as much as possible, reduce teacher talk time and plan a range of activities and interactions such as group or pair work, discussions or short student presentations. ESL teaching jobs at Chinese universities come with a lot of prestige but are hard to land. Class sizes will vary from study groups of 6 to 12 students to lectures of 30 to 50 students and your students will be around 18 to 25 years old. As in language schools, improving English fluency and pronunciation is the main goal of your lessons. Universities often provide media like computers and interactive whiteboards you can use to conduct your lessons. You will have to teach adults from beginner to advanced levels, up to business people who want to hone their presentation or negotiation skills. Adults are self-motivated and self-disciplined and thus easier to handle for teachers, but have higher expectations for your lessons and may challenge your language skills. Depending on the students’ level, you will have to apply different teaching methods from grammar exercises to advanced debates and language analysis. As a Director of Studies (DoS), also referred to as Academic Manager or Head Teacher, you are in charge of the teaching team, both local and foreign teachers and running the academic side of the school. You will have admin duties to attend to, including scheduling classes for teachers, organizing school events, dealing with issues from students as well as internal disciplinary issues within the teaching team. The Director of Studies will also teach a few classes. As China is incredibly large, choosing the city in which you want to teach might be the hardest decision. Whether you want to find an ESL teaching job in Shanghai downtown or somewhere more remote, we have suitable job options for you. From the more than 60 Chinese cities that we have partner schools with, these are the 10 most popular: Shanghai, Beijing, Shenzhen, Guangzhou, Chongqing, Hangzhou, Tianjin, Suzhou, Dalian, and Chengdu. The Best Time to Apply: Any Time! You can apply anytime! We have year-round openings for private language schools. Public school jobs regularly hire for the start of the academic year in September, but they do have jobs starting other times, too. We recommend applying four to six months before you want to start teaching English in China. The interview process with your future employer can take anything from one to three weeks and the work visa application process normally takes two to four month. You are a native English-speaker with a passport from the US, Canada, the UK, Ireland, South Africa, Australia or New Zealand (or speak English on a native-level with an accent from one of these countries). You have a four-year degree, Bachelor or higher. You have a clean criminal background check. The above-mentioned are official requirements by the Chinese government to be eligible for a regular Z visa which you need to teach English in China legally. You have a TEFL certification (or comparable). If you don’t have one, we can arrange a TEFL course in advance of your teaching job. Teaching experience is preferred, but often not necessary. Some schools require reference letters from former employers. You submit your application along with preferences for cities and/or student ages. We will send you four or five suitable job options to consider. We set up Skype interviews with the schools you select. You conduct the interviews with your future employers. You accept a job with the school that suits you best. We provide the school with your documents for the visa application. Once the visa is ready, you book your flight to China. You arrive at your school and begin training and orientation. You can submit your application here, it just takes a few minutes. As mentioned, the whole process will take from three to six month. Whenever you need advice, you can contact one of our consultants. We will happily answer your questions and provide you with broad information. There’s no obligation for you to accept one of our job offers. We will never ask for any fees from you – we get paid by the schools. No matter if we can place you or not, everything is totally risk-free for you. Gold Star TEFL Recruitment is a TEFL (Teaching English as a Foreign Language) teacher recruitment agency, specialized in helping ESL teachers getting the ESL teaching jobs in China at trusted and recommendable schools. It was founded in 2009 by former teachers. We provide an honest, professional and overall free placement service for our teachers. In over the years, we have helped more than 1,600 teachers to get jobs in more than 550 schools and are proud of the many positive reviews we’ve gotten. We earn placement fees from the schools or employers, which means our service is completely free for the teachers. Neither we charge any money from you nor will we deduct a cut from your salary. So if you want to teach English abroad, travel the world full-time, learn about other regions of the world and have new experiences, come and teach in China! When you will be living there, you will quickly find yourself immersed in one of the most fascinating and rapid-changing countries on this planet. You will have enriching experiences and at the same time leave a positive impact on the lives of your students. Things are different in China. You should be a spontaneous, sociable person who easily adapts to a new culture if you want to succeed as an ESL teacher in China. At least, you should be open to an adventure, because that is exactly what teaching English in China is. Most teachers say it was one of the best experiences of their lives and they returned home as a different person. Will you, too? Send us your application including your job preferences today. We are looking for to assisting you in finding the English teaching job in China you will love! I start my TEFL in December. Can I start applying now? Also, are there International schools available? I would be bringing my 7 year old son with me and would like him to have the opportunity to attend international as he does not speak Mandarin. What are the options for those bringing children? I have a Bachelor’s, I currently homeschool, will have my TEFL, and I’m currently in my Master’s program. I would love to learn more as the recruiter I was previously working with seemed to work for one company that is not suitable for my needs. My wechat is wxid_eqixof3fvtq22. Hello Amie, I will send you an email with further information.